Long before Stokes Croft became Bristol’s most talked-about locale, The Pipe & Slippers was being hailed as one of the best boozers in Bristol. Previously a so-so watering hole called The Berkley Castle (a tribute to its former name can still be found in the cast iron signage out front), the pub was given a new lease of life in 2004 by Joby Andrews and Mike Cranney. 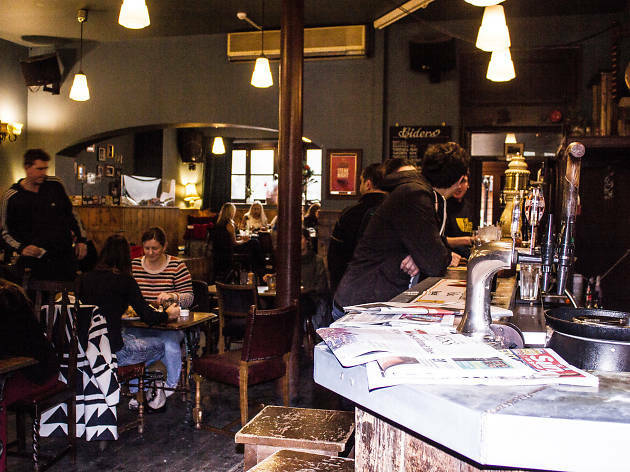 Such was the success of their refurbishment that the duo has since applied the same formula to two other Bristol pubs, with equally impressive results. The Pipe & Slippers remains the jewel in the crown of their growing empire, though. Dimly but warmly lit, with vintage 1950s furniture and an intimate smoking space outside, the pub does the little things well. 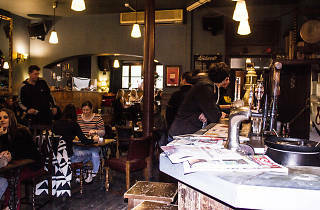 There’s always a couple of draught ales and ciders, plus a decent range of premium lagers. The food – a mix of pub classics and inventive weekly specials – is among the best you’ll find in the area, and the Sunday roasts are extremely popular. Sunday is a rather special day at The Pipe, when it becomes a must-visit destination for the ‘all weekend’ party crowd nursing hangovers. As you’d expect for a late opening pub in Stokes Croft, DJs are a regular feature. The music varies, though it’s usually tailored towards the venue’s party crowd of students, thirtysomethings, local artists and self-proclaimed hipsters. It’s a blend that makes for a lively environment on weekends, in particular.